Countertop electric roasters provide a convenient and energy-efficient alternative to the full-sized oven in your kitchen. They're especially useful during large get-togethers, when there are multiple demands on your main oven. You could use the roaster to prepare a ham or turkey, for example, which frees the oven for side dishes. Alternatively, you can use the oven for your main dish and the roaster to prepare a side dish such as scalloped potatoes. 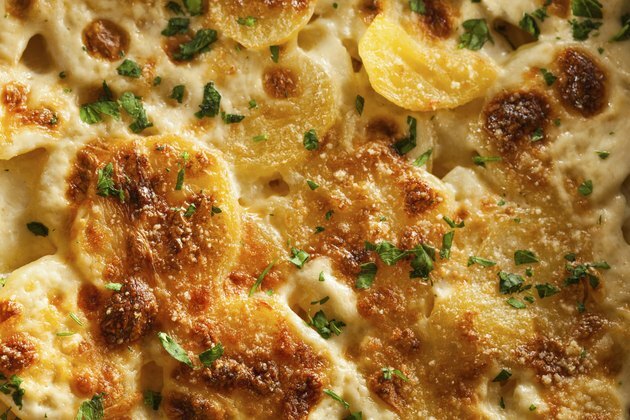 Scalloped potatoes are one of a number of convenient, widely-eaten side dishes that can be prepared in casserole form. The dish calls for thinly-sliced potatoes to be layered into a casserole with salt and pepper, and white sauce, then baked until the potatoes are tender. The potatoes' starch thickens the sauce, giving the dish a rich and creamy texture. Most recipes call for some onion to make the potatoes more savory. Many use a cream soup for part of the sauce for additional flavor, or add ham, bacon or cheese. There are two options for making scalloped potatoes in a countertop roaster, depending on how large a group you're serving and why you're using the roaster. For example, a two-quart casserole could serve six to eight as a side dish. You might bake a two-quart casserole in the roaster to free up your oven for other purposes. The second alternative is to prepare your scalloped potatoes directly in the roaster's insert, treating it as a giant casserole dish. In a standard 18-quart roaster, that might serve 40 to 60 portions. To prepare the scalloped potatoes in your roaster as a conventional casserole, begin by thoroughly greasing the casserole dish. Assemble the potatoes and sauce in the dish as directed in your favorite recipe. Plug in the countertop roaster and preheat it to 350 F with the lid in place. Once it's warmed, place the wire rack in your roaster and set the casserole dish on the rack. Cover the roaster and bake for 75 to 90 minutes until the casserole is bubbly and thickened, and the potatoes are tender. Preparing scalloped potatoes directly in the roaster makes for a much larger batch. An 18-quart roaster can comfortably hold 12 quarts of the casserole, roughly equal to five 9- by 13-inch casserole dishes. This will take approximately 25 pounds of potatoes. Grease the roaster and line it with foil or parchment paper if desired to minimize cleanup. Assemble the recipe in the roaster's roasting pan, then place the pan in the roaster and set it to 350 F. Cover and bake for approximately an hour and a half until the casserole is bubbly and thickened, and the potatoes are tender.